House in Edenton found to be oldest in N.C.
After two years of investigation of what was a planned rental property, the oldest dated house in North Carolina has been identified in Edenton. 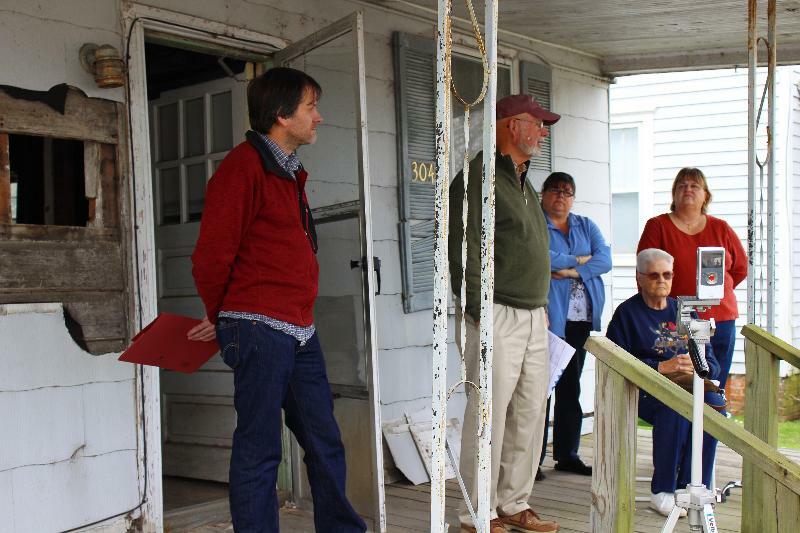 Preservationists with the N.C. Historic Preservation Office, architectural historians with the Architectural Research Department at Colonial Williamsburg and local historians participated in the research. Timbers in the one-and-a-half story house have been dated to 1718/19. Dendrochronologist Michael Worthington made the announcement on Jan. 11, after confirming the date by finding the age of the tree rings of timbers in the structure. At his side was Steve Lane, who with his wife Linda had bought the house to turn into a rental property. The house was assigned a date of ca. 1900 in the Edenton National Register Historic District, but restoration carpenter Wayne Griffin and expert cabinetmaker Don Jordan exposed timber framing, weatherboarding, ceiling joists and other features that seemed much older. The Lanes contacted HPO Restoration Specialist Reid Thomas in the Eastern Office for guidance in learning about the unique building, and he assisted by leading and coordinating three volunteer architectural visits. The Lanes understood the potential importance of the house and sought and funded additional study. Originally 16 feet by 25 feet, the house was divided in two rooms on the first floor and two in the attic. It was probably constructed in 1719. The original owners are not known. The historical significance of the house is that it offers a rare glimpse into an almost lost vernacular building type in North Carolina, the kind that would be a home for the average citizen. It provides valuable information about building type, house form and construction technology in eastern North Carolina as early as 1719. Further research may find additional historically significant information.